Palm oil is the quintessence of West Africa – it is complex, an acquired taste and reckoned to be rather unhealthy. Small chop is the addition of ingredients that make it palatable for European taste. 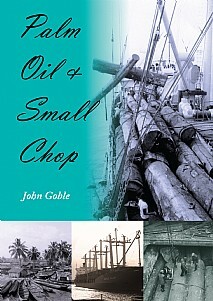 From the unique perspective of working aboard merchant ships trading to the area, the author provides a viewpoint of the first 25 years of West African independence – it is simultaneously the story of the final years of many of the British Merchant Navy’s liner trades where fortunes largely depended upon imperial routes. The author served in ships of three very different shipping companies, two British and one Nigerian, and from this unusual breadth of experience, a fascinating story of ships, their crews, their cargoes and the peoples from Senegal to Angola is told. The last of the famous surf ports, the navigation of the twisting waterways of the Niger Delta and the ascent of the great Congo River are vividly described. A colourful picture is painted of the astonishing variety of cargoes and how ships almost literally felt their way across treacherous mudbanks, picked their way through mangrove-bordered creeks with local pilots boarding from canoes. The reader also meets the local inhabitants who include hard-working men from the desert interior, their more wily brethren from the coastal regions, itinerant traders and plausible rogues, the cowed workers of Portuguese Angola and, above all, the famous Kroomen of Freetown who helped work the ships around this intriguing coast of crashing surf and foetid creeks. With the fortunes of the new nations faltering, the Palm Line ships are forced to find work in other trades. The author experiences daily life in Poland under martial law, later finding himself on voyages to Brazil, the Indian sub-continent and Australia aboard ships primarily designed for the West African ports. Told sympathetically, yet with a keen eye for the absurd and downright funny, this is a lively, informative story of ordinary people trying to make a living in a world where events, over which they have no control, change their lives irreversibly. A well-written book that will appeal to all who are interested in ships and shipping, modern and maritime history, with a special interest in West Africa. It will also attract readers who enjoy well-told traveller’s tales of fascinating people and places. '...the author has many other fascinating experiences to convey in lively detail and language... ...there are beautiful and fascinating places to visit... ...vividly conveys the liveliness, humour, mood changes and bizarre customs on the coast. Thankfully, the narrative is all the more authentic and evocative in being devoid of the curse of political correctmess. ...is very well written.' QSO.